An injury insurance scheme for Bangladeshi garment workers has been set up as part of a collaboration between the government, the International Labour Organization (ILO), and Germany. The Employment Injury Insurance (EII) Scheme for Bangladesh will see RMG workers receive payment in case of injury, while employers will benefit from low-cost and no-fault accident compensation insurance for workers. The ILO said the experience of setting up a mechanism to deliver compensation in the aftermath of Rana Plaza highlighted the need for an insurance scheme to be established. A letter of intent for the scheme was signed at a ceremony in Dhaka yesterday (6 October 2015). In the initial stages, the three signatories will work together on the design of a suitable EII scheme for the RMG sector. Legislative issues will be addressed and national institutional capacities to implement such a scheme developed. In later stages, a pilot scheme will be launched before being scaled up to run nationwide and extended to other industrial sectors. An initial workshop was held in Dhaka in January to present the concept and principles of the EII scheme to stakeholders. This was followed by an ILO mission to Dhaka in May and June to launch a feasibility study. In July, the Government formally requested ILO Bangladesh to directly coordinate any donor initiatives for the establishment of an EII and to design a combined scheme for this purpose. 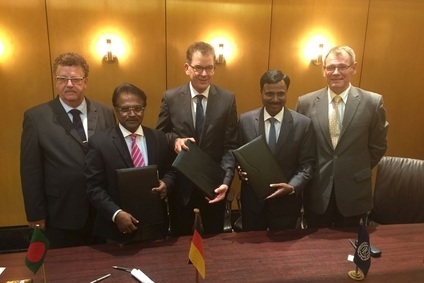 As a result, ILO is now cooperating closely with German organisations German Social Accident Insurance (DGUV) and GIZ.